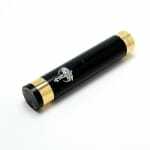 Sorry, Nemesis Black with Golden Rings (Brass) - Clone by HCigar has been discontinued. Nemesis Mod in black stainless steel body, with golden brass rings, 1:1 clone by HCigar. A twist on one of the most popular mods in the vaping community. This beautiful Nemesis Black Mod with gold rings is a stylish unique look for one of the most popular mechanical mods. It is a 1:1 clone by HCigar, one of the most trusted clone makers in the vape world. It is of 100% pure brass, and has the Nemesis logo "Angel of Death" laser-engraved on the body as well as a unique serial number like all other HCigar mod clones. The connector pins are adjustable and silver plated. The adjustable ring around the silver plated thread features two air vents for atomizer cooling. It has five different removable rings to adjust it to any size of batteries: 18650, 18490, 18500, 18350, a kick can also be used in addition to any size of battery. It is activated by pressing a button at the bottom of the mod, which is spring activated. You can lower the lowest ring above the button by a couple twist to lock the button so it doesn't fire when the Nemesis mod is standing upright. With a single twist of this ring, additional air vents are shown, improving battery cooling. A beautiful and different look on a classic design, this Nemesis Black Mod is a beauty. Accepted batteries : 18350, 18490/18500, 18650, + optional kick.